Halloween is right at the doorstep! Perhaps you didn’t even think of taking advantage of this holiday and increasing the sales in your online store, or on the contrary, you are already up and running with your advertising companies. Anyway, we decided to remind you once again about a few working promotion ideas that you can start using right now. Besides, they are perfect for any holiday, not just on Halloween. Most importantly, you don’t have to change the structure of your store in order to apply these ideas. You simply add a couple of elements that can cheer up your customers and increase your profits. Create a themed welcoming pop up that will draw the attention of your visitors immediately upon entering the site. Let it be beautiful, interesting and beneficial for the client. You can offer, for example, a promotional code or a favorable discount, which customers can apply right away and start shopping at more attractive prices. If you don’t have time to draw popups, just find and download the ready-made solutions — Promotion Pop Up for Magento 2 and Promotion Pop Up for PrestaShop 1.7. Your main page almost certainly has a slider or some banners, use them to promote your products or services. Get creative and replace the generic messages with interesting and thematic ones, e.g. : “Free delivery for $30+ orders by our ghosts on Halloween night” or “Super offer from Count Dracula: – 20% on all coats from the fall collection”. Send your customers beautifully designed gift cards. They can be either printed on thick paper or integrated into an email. But the best option is to send it via regular mail — your customers would love to be able to hold your beautiful card in their hands. Gift cards can be sent both 2 weeks before the holiday and on its eve. Anyway, on the day of the event be sure to remind your customers that they have a gift card and can use it right now. There are all sorts of gift card offers: discounts, cash bonuses, free gifts for purchases, free shipping and more — everything you want and can offer to your customers. 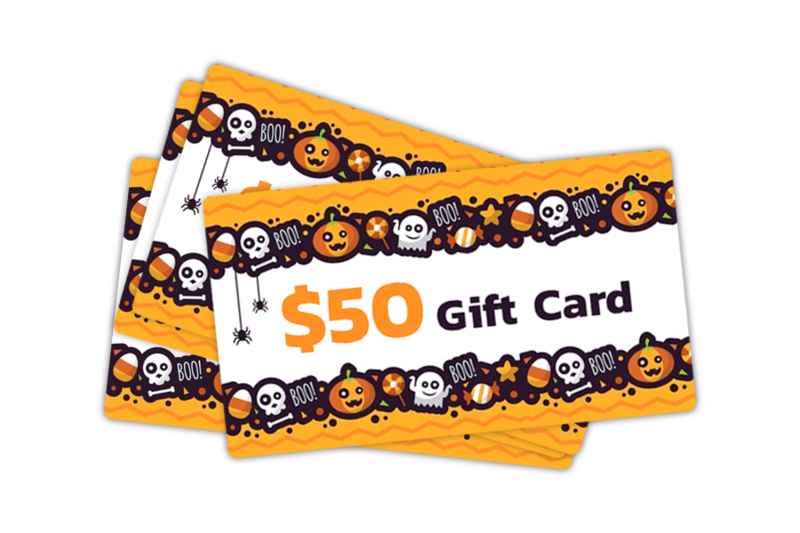 You can also distribute gift cards for purchases made on the day of the holiday with the help of a courier, thereby prolonging the buying activity after the holiday. Email marketing is a tool you can’t do without in ecommerce, although it often gets neglected. Emails remind and encourage buyers to go to your Halloween site. Large ecommerce companies send their customers a lot of different emails not just on holidays, but on regular days as well. Yes, people do not like sales letters that litter their mail, but they view them differently during holidays. Colorful email offering gifts and discounts — who can possibly refuse that? Little advice: your email company should be well thought out, all the way up to the last day of the promotion. You must understand what, when and to whom you will send. Each letter should contain a link to your website, for example, in the form of the “Start shopping” or “Buy now” buttons. Return your customers who abandoned their baskets with the help of original messages like: “You abandoned your cart and the evil monsters are coming after you! But we will save you! Here is your 10% discount on the whole basket! Complete your purchases and it will kill the evil monsters :) ”. The buying activity is always much higher during holidays — someone is looking for gifts, someone is decorating the house, someone is picking up a costume or dress for a party. Be sure to capitalize on it and use Upselling & Cross selling in your store. Offer your customers a better product compared to what they have chosen in your store. Perhaps it will be a little more expensive, but if you are convincing enough, the choice of the client will be in favor of your offer. You can also suggest buying related products at a better price than if they are sold separately. Thus you will increase profits and win the loyalty of your buyer. Summing things up, I would like to emphasize once again that all these tools are suitable not only for Halloween. All these sales ideas can be used on any other holiday, or you can think up your own reason for such a mini marketing campaign. It can be carried out on the birthday of your company, during the lunar eclipse, on the longest day of the year — whatever you can think of. It all depends on your creativity and the desire to bring more satisfied regular customers to your online store. If you have any questions, feel free to ask them in the comments, and we will certainly answer them! The BelVG team wishes you a good start of the week and Happy Halloween!